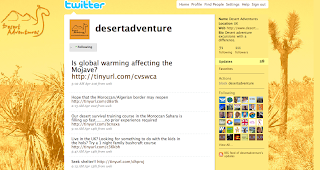 A couple weeks ago I blogged about twitters that I like to follow. That blog post was such a hit that I thought I’d do it again, but, this time with a bit more focus. This week I am blogging about twittering businesses in from the Coachella Valley. Below are just a few that might be of interest to you….. Remember to click each picture to be directed to each business’s twitter. Nudist Colony twitters. Very cool. Our very own, Kimberly Cheng’s twitter page. Rad. 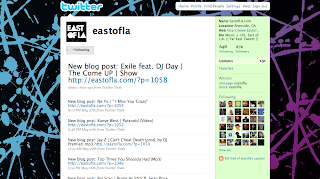 My favorite place to download free music, EastofLA.com. Holla. 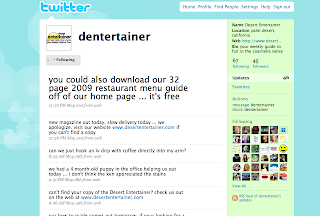 Desert Entertainer’s twitter. Free downloadlable restaurant guide? Sweet. It’s always an adventure on Desert Adventure’s twitter. 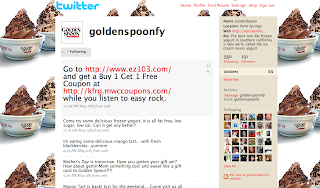 I love Golden Spoon. You do too. Next week the CVAS blog will point out some other twitterers that are pretty cool. I’m thinking maybe bands and artists around the desert that are pretty awesome. Next ArticleGalleries a Go Go!